When do you take action? Are you usually spontaneous and act instantly? Or do you stop, ponder and reflect? That’s interesting by itself – how we come to read or notice things. And, when we take action. It took me six months from hearing an in-depth interview with the author to reading his book. Marketing Insight: What’s the time lag for your customers between hearing about your product/service for the first time and buying it? And, as he reminds us, that one day our time is going to run out. Yep, we’re all going to die. And, on your deathbed will you be asking yourself: Am I about to die with life still in me? I’ll admit this is me! That explains why I was drawn to this book. What would your life look like if you made every day count? What are you going to do about it right now? Todd Henry is not pointing to a brand new concept. I’m sure you’ve heard it before: We’re all gonna die! And, he has captured it neatly: Die Empty. Short, sweet, succinct. Great concept! It’d make a great life motto or even a wonderful tattoo. TIP: I work with a lot of people wanting to come up with brand new concepts. That’s hard, really hard to do. And, sometimes it’s not about brand new. Sometimes it’s simply about streamlining or updating an enduring and existing idea. Make it better just like Todd has done here. For many people, the dream of life is to not have to work. This is why you enter lotto isn’t? Quit your job, retire on a beach, play golf… Yet, the happiness research shows that when we work hard at pursuing something important to us, this is good for our overall wellbeing. As Victor Frankl might have said, ‘without purpose we all die’. 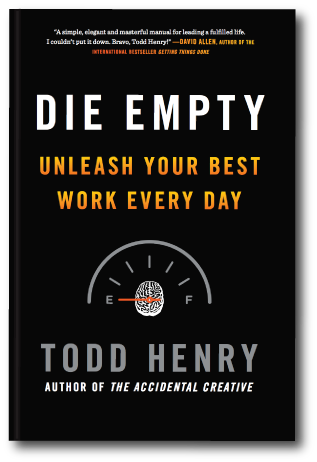 The thing that Todd has done really well is to connect ‘die empty’ to work. That’s what makes this a contemporary update on an old theme. It reflects the shift in work from doing someone else’s job to creating our own jobs and lifestyles through the work we do. This brings us to the big opportunity. And I think it lives in these three questions. What are you going to die empty creating? In other words, what work are you going to do? Are you doing your best work? Or more specifically, are you doing your best work today? And, how you can turn a simple manifesto into a compelling book. Buy the book because you want to Die Empty. And, create your manifesto to define your purpose and to live empty! TIP: What a great title! It’s a call to arms! It’s a strong verb with a clever descriptive word. This is a powerful way to create a unique concept. Steal this approach and do the same for your big idea.